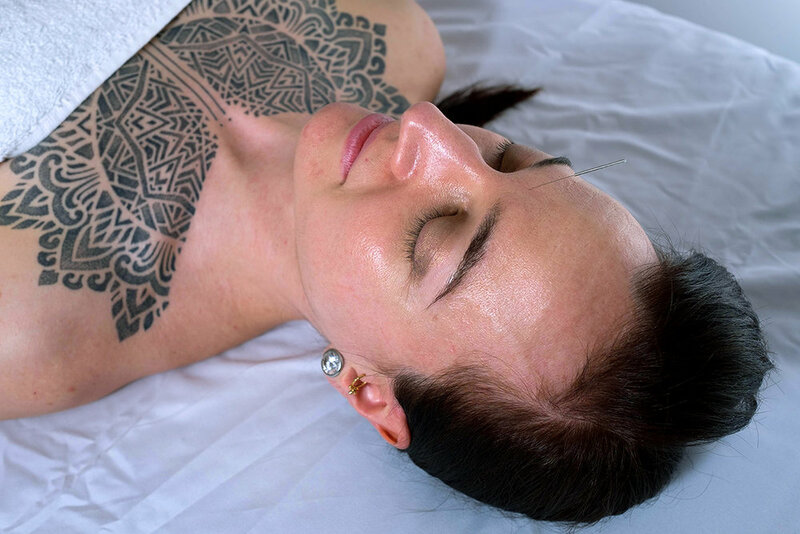 A completely holistic beauty treatment to bring a natural glow to your face, facial acupuncture improves your complexion, reduces fine lines and lifts sagging skin over the course of a series of visits. This treatment works by flushing fresh blood circulation into the face as well as facilitating drainage of toxins out of the body. It can improve your skin tone and skin texture, and it can lessen fine lines. During the same appointment, acupuncture points on the body can be utilized to balance and boost your constitution in order to maintain healthier skin. Gua sha facial massage and LED light therapy may be included in your treatment. Your initial two-hour visit will include a comprehensive intake about your general health history. If you have not had any experience with acupuncture, it is recommended to receive either a regular acupuncture treatment or a facial gua sha treatment first. Please be sure to inform me of any skin sensitivities or allergies to skin care products or ingredients. *Please be advised that this is a beauty treatment and cannot be covered by insurance. Pre-screening is required in order to determine whether this is appropriate for your situation as there are some contraindications. Please be prepared for a 15-minute phone screening. This treatment is meant to be conducted as part of a series.